Renz now photographs above as well as below water and tries to get as intimate as possible with his subjects. 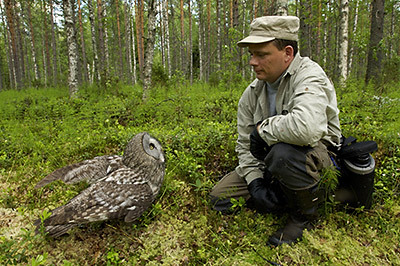 The most memorable time of his career so far was a project with Great Grey Owls in Finland. Over a period of 7 weeks he gained the trust of a breeding female, as shown in the picture above. Chica, as the owl was named, was gradually accustomed to accept food given very close to the photographer and his camera. The process took a long time because great care was taken not to impact the bird's natural behaviour by feeding too much. At the end of the period Chica would sit willingly on the ground next to the photographer even without food present. Chica's pictures can be found in the Great Grey Owl gallery.